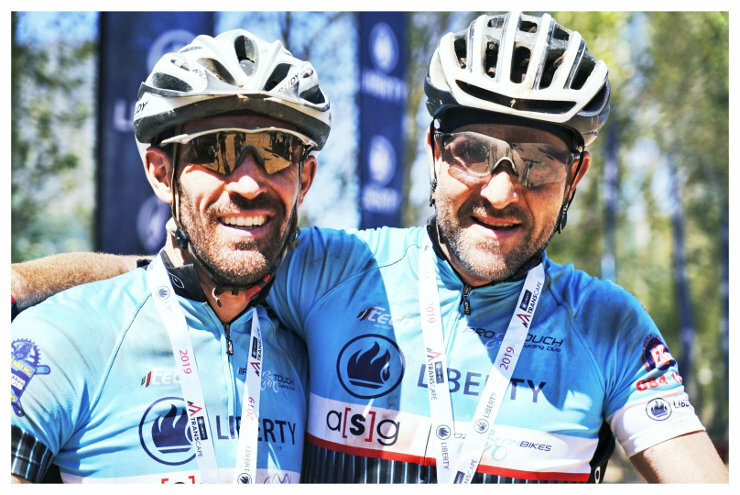 Justin van der Linde and Albertus Jooste took the honours in the Liberty TransCape MTB Encounter from Grabouw to Franschhoek in the Cape Winelands today after they won the final stage. The Rustenburg riders crowned a successful week in the 591km, seven-stage mountain-bike race by crossing the finish line at Holden Manz Wine Estate in 3:38:33. Dirk Haentzschel and Mario Hakim Abu-Id, who won the third and fifth stages, were second, with stage one winners Damien Ingram and Stuart Cathcart filling third place. Van der Linde and Jooste had an overall time of 26:42:42, while Ingram and Cathcart filled the second spot on the podium. In third place were Haentzschel and Abu-Id. After building up a handy lead following their stage two win, Van der Linde said they almost came unstuck on stage five when a crash in the peloton saw him suffer a damaged back wheel. “But we managed to regroup quite nicely and only lost about nine minutes,” he added. Riding in their second TransCape, which is powered by Volvo and started in George on Sunday, Van der Linde said it had been “another brilliant experience”. He took the final stage in 3:26:29 and was followed home by compatriot Stefan Hackl and South African Jan Braai. “The spirit of the race and the chance to mix with the other riders at the post-stage functions really makes this event very special,” he said. The German added he would definitely be urging his cycling friends to experience the high-quality event the race organisers offer.